NASSAU, The Bahamas -- Governor General Sir Arthur Foulkes swore in the Rt. Hon. Perry Gladstone Christie as the fifth prime minister of the Commonwealth of The Bahamas during an Appointment Ceremony at Government House, Tuesday, May 8, 2012, one day after the May 7 general election. During the general election, Prime Minister Christie’s Progressive Liberal Party won over the Free National Movement and he retained his seat as the Member of Parliament for Centreville, formerly the Farm Road Constituency. 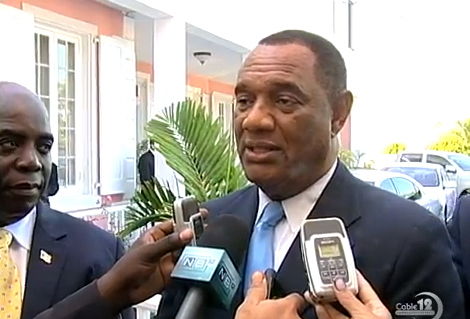 He also served as the third Prime Minister of The Bahamas and Minister of Finance from May 2, 2002 to May 2, 2007. Following the Oath of Office, Prime Minister Christie once again thanked the Bahamian people for expressing confidence in him. “The voice of the people was heard yesterday with great thunder and awesome power,” the Prime Minister said. “I am humbled by the mandate that has thus been bestowed upon me. Prime Minister Christie thaned young Bahamians for their support, and said he would exert every effort to alleviate the problem of joblessness and lack of opportunities that plagues them more than any other sector of the population. Prime Minister Christie also extended gratitude to members of the Progressive Liberal Party who worked during the election campaign to ensure victory. 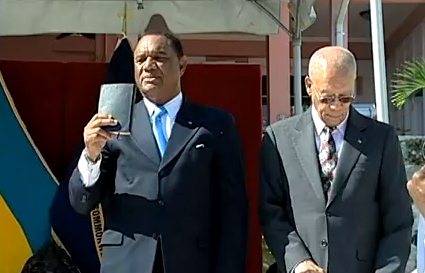 He went on to invite all Bahamians to join him in a spirit of patriotism and mutual goodwill to building the country. He also showed appreciation to the people of the Centreville Constituency for returning him as their representative. Lastly, the Prime Minister thanked his wife Bernadette and his three children: Steffan, Adam and Alexandra for sticking with him through the campaign process. Besides Mrs Christie and their families, also in attendance were Lady Foulkes; elected Members of Parliament and their spouses; senior Government Officials; Ministers of the Gospel and supporters of the Progressive Liberal Party. The Prime Minister said in his remarks that he has already turned his mind to the important task of forming a new government. “The first of my ministerial appointments will be announced tomorrow (Wednesday, May 9) and my entire Cabinet will be fully assembled by Friday. “My transition team headed by the former Attorney General Sean McWeeney, QC, is already hard at work and I propose to appoint Mr Wendell Major CMG, later today, as the new Acting Cabinet Secretary,” Prime Minister Christie said. “I promised to hit the ground running and I have done so. Be assured that the days and months ahead, you will witness the steady and systematic fulfilment of all that we have promised. “There are many barriers, and may the great people of our country assist us as we now set upon the urgent task of making our country safe and prosperous for all its people,” the Prime Minister said.